The Whale defies all the odds to make people reconsider what they thought they knew about orcas, the so-called killer whale. Sometimes friendship comes from the most unexpected places. 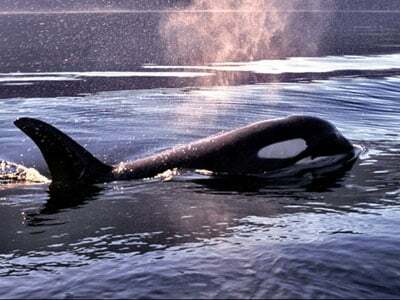 The new documentary The Whale, which was helmed by husband and wife National Geographic contributors Michael Parfit and Suzanne Chisholm, proves just that, as it chronicles the life of an extraordinary orca named Luna. While orcas are highly social and dependent on their families, Luna proves that his wild species can peacefully co-exist with, and depend on, humans for emotional support. The Whale follows Luna as he becomes separated from his family in the Nootka Sound, off the coast of Vancouver Island. Alone, Luna makes contact with humans at boats and docks, begging for attention. While people initially think he needs help finding food and shelter, Luna ultimately proves he can take care of himself, but still needs interaction and love. The government and local population disagree on what to do with Luna; some want to help find Luna’s family so that they can reconnect, while others want to keep him safe in Nootka Sound. The Whale focuses on the important message that people shouldn’t treat animals any differently than they would other humans. Luna, just like other orcas, have just as much intelligence and individuality as humans, even if they can’t verbally show it. With Luna continuously visiting the people of Nootka Island, he proves that animals also need companionship and love. He wasn’t visiting Parfit, Chisholm and the other inhabitants of the island because he was relying on them for food and protection; as Parfit has said, Luna was interacting with them because he missed the support and friendship of his family. Before filming The Whale, there was a political debate over whether or not the government should keep Luna alive, as some feared he would harm humans. Orcas who are held in captivity are believed to suffer from post-traumatic stress disorder, because they’re among the most social animals in the world, and stay with their families for life. Some orcas held in captivity harm people, as they don’t know how to deal with being separated from their families. The Whale proves that not all orcas are harmful to people. While orcas should stay with their families, Luna showed that wild animals do trust humans enough to not hurt them. He also proved that once we get to truly understand animals that we thought we already knew, we come to realize that they have the same emotions as we do. Parfit and Chisholm made the right decision in hiring Reynolds to narrate The Whale. Having been born and raised in Vancouver, near where Luna began interacting with people, he came to truly care about the orca and what happened to him. While the well-known actor will surely help initially draw in audiences who may not have otherwise heard about the film, viewers will become intrigued by the film’s premise, and will want to learn more about Luna. Documentaries, particularly those focused on subjects on which people already have a pre-conceived notion, often struggle to find a sizable audience in theaters. But like Luna, The Whale defies all the odds to make people reconsider what they thought they knew about orcas, the so-called killer whale. Luna helps break the popular belief that orcas aren’t as intelligent and reliant on their families as humans are. Viewers will surely come to appreciate the emotions orcas exhibit, and the bonds they form, after watching The Whale.